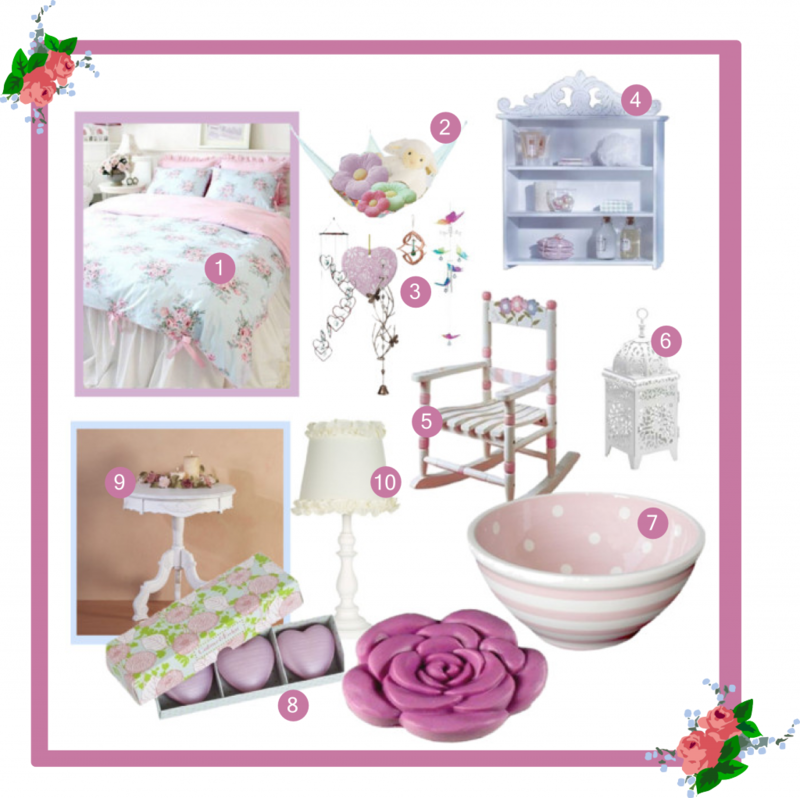 Bedroom Decor Ideas: Shabby Chic Bedroom - Oh So Girly! What would your ideal bedroom look like? If you would like to purcahse any of the items shown here, click on the highlighted pink text below to get to the site where these items can be purchased. I think this cotton floral bedding set from Victoria’s deco is really pretty, from the bunches of roses to the ribbons that tie up the end of the duvet. It looks fresh, clean, delicate and romantic, and I think it epitomises the very essence of everything that is girly. It would look great in a simple decorated predominantly white bedroom with hints of pastel blue and pink bedroom decorations. White stuffed animal that is both cute and suits the general white theme of the bedroom decor. Pink shabby chic heart-shaped ornament, designed by myself on Zazzle. The swirling carved crown top of this shelf gives it an air of Victorian style which I think works really well with shabby chic decor. This would look good in a little girls room but I think with a pillow on it, it could also make a pretty addition to a more grown-up girly girl’s room. I love how the pink, white and blue of the chair complements the color theme of the room. I feel that floral filigree patterns go well with a shabby chic style. This white-painted metal lantern adds a touch of antique elegance to the room. What I really like to do in my room is to get a bowl I like, like this one, and fill it with deliciously scented soaps. I find that it acts a bit like pot pouri, giving your whole room a permanent clean, flower-fresh scent. If you fill your bowl with soaps, you may want to go all out and get ones that look nice. I really like this heart-shaped and rose-shaped soap set. A table like this complements the shelves and other white items in this shabby chic girls bedroom set. Note how the curves of the table legs echoes the curves of the shelf’s crown. You can get a table like this to make up your bedside table or you can have it elsewhere in the room, perhaps topped with a vase of dried flowers inside or your soap bowl. Fresh and bright, this table lamp with ruffle shade completes this girls bedroom decor ideas set.